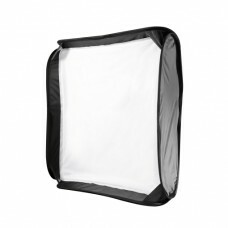 softbox 15x20cm5 light filters/color filters (39x80mm) each in the colors yellow, red, blue, 3x oran..
extremely high performance ring lampSmooth adjustment of brightness from 20% ~ 100%232 LEDs for maxi..
very sturdy wall mount boom with crankload capacity up to 6 kgtiltable and rotatablerotatable and ch.. External system flash for cameras from Canonautomatic zoom reflector from 24 to 105mm manual ad..
octagon softbox for mounting on system flashesideal for people photography due to natural, round ref..
powerful ring flash for shadow-free illuminationexchangeable 4,500 mA lithium batterystroboscope fla.. Tale 5x stenski kavelj se lahko namesti na steno ali strop. Nanj je možno namestit do 5 papirnata oz..
ideal for macro, medical and scientific photographyGuide number 14asynchronous switchable flash tube.. Tale 3x stenski ali stropni kavelj se lahko namesti na steno ali strop. Nanj je možno namestit do 3 ..
Power adapter for the devices of the Walimex Pro 2Go seriesEnables continuous use through direct net..
WLithium ion batteryHigh capacity6,000 mAh / 11.1V / 66.6 WExtremely long-life thanks to the large n..
compact like a system flash - powerful like a studio flashdigital flash with 180Ws for simple pluggi.. Product information "walimex pro Magic Softbox f. System Flash, 60x60cm"professional tool for system..
Universal and infinitely adjustable accessory holder for system and compact flashesCompatible with B.. Product information "walimex pro TELE Background System, 120-307cm"transportable background systemte.. Product information "walimex pro TELE Background System, 225-400cm"transportable background systemte..
Set with three Premium studio flashes of the VC Excellence series incl. integrated receiver with 16 .. Product information "walimex XXL Background System, 190-465cm"particularly sturdy Background System ..
idealno za na pot ali v studius pritrdilnimi pasovi (na stative, palice...)vključena prenosna torba..
idealno za na pot ali v studius pritrdilnimi pasovi (na stative, palice...)optimalno za portrtetevkl..